The TRCA owns and operates two large dams, and maintains over two-dozen pieces of water control infrastructure within our jurisdiction. 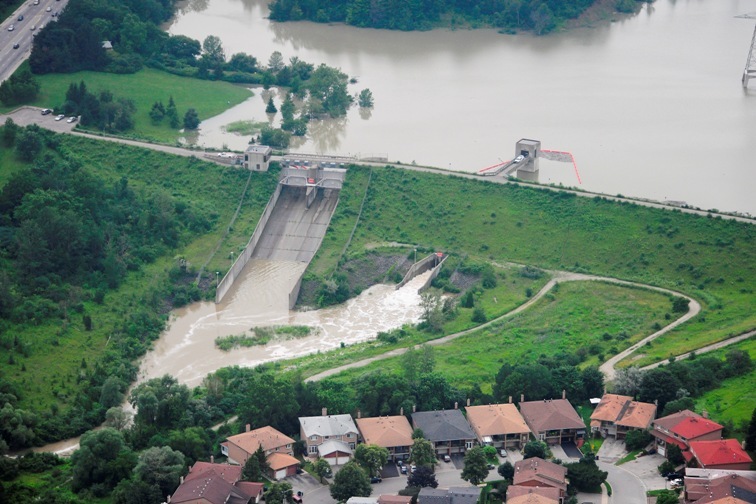 These dams are maintained and operated by TRCA Flood Infrastructure staff on a 24/hr a day basis when required, based on weather patterns and watershed conditions. There are a number of safety measures in place at the dams, including signage, booms, and fencing. Swimming in the reservoir above the dams or in the river below the dams is extremely dangerous and is not permitted. Fishing near the dams is not permitted. Children and pets should be monitored and kept away from the water at all times. If there is an emergency call 911 immediately. The G Ross Lord Dam was constructed in 1973 to provide flood control for the West Don River. The dam operates in conjunction with downstream flood control channels to reduce the risk of flooding to flood vulnerable communities. G Ross Lord Dam is an earthen embankment dam with two concrete control structures. The first control structure is comprised of two low level gates used to draw the reservoir down after a rain event. The second control structure has two large radial arm gates for use during extreme storm events. 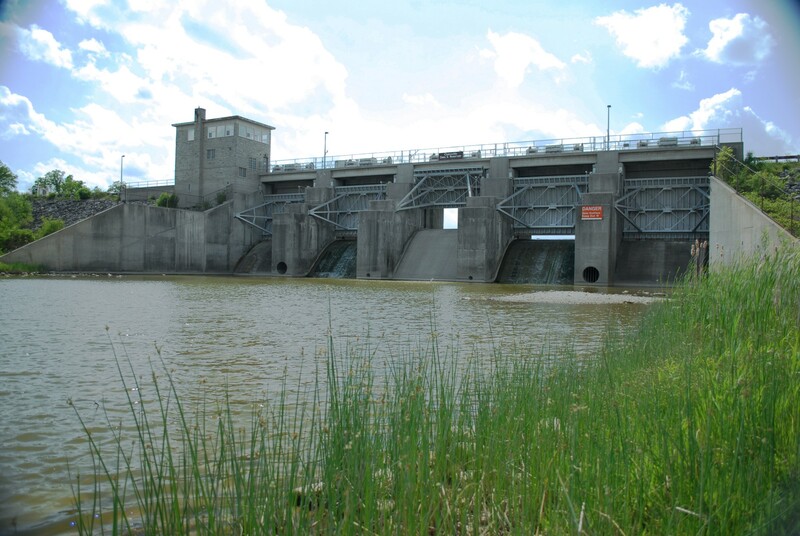 Claireville Dam was constructed to provide flood control for the West Humber River. The dam has earth embankments with a concrete control structure. The spillway and outlet works consists of five radial arm gates. Claireville Dam is located at Finch and Highway 427. 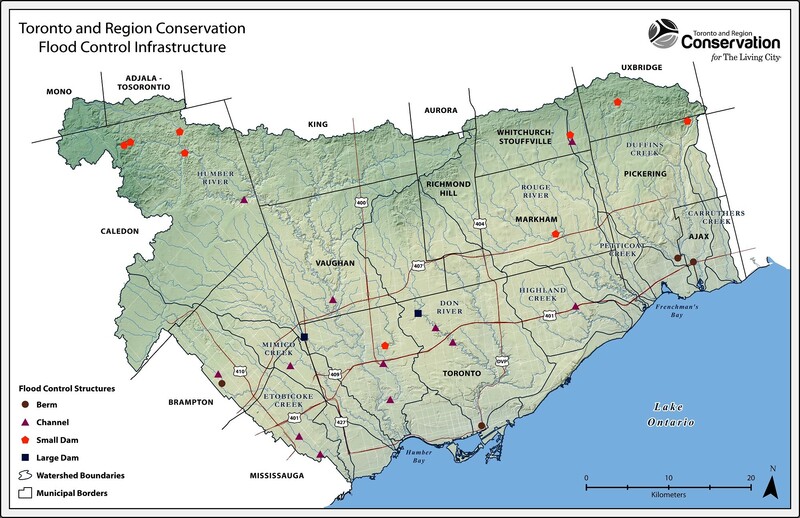 In addition to these large dams, TRCA maintains a number of small dams and flood control channels. While these structures are not operated during flood events it is important to note that they are flood control infrastructure and therefore have similar risks associated with them. The same safety precautions should be observed around these structures. TRCA flood structures span across all our watersheds. While some dams were constructed and used for flood control others are used primarily for recreation.